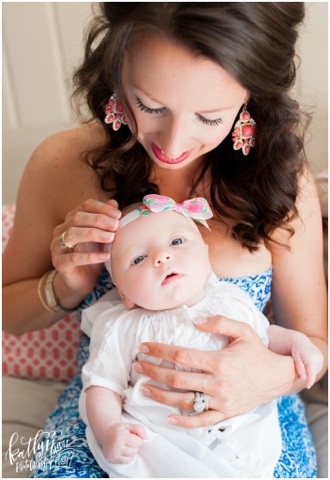 First of all, I received the first sneak preview the other day from our recent family photo session. Thanks to all of you on Snapchat (@alizadventures) who helped me decide to wear my hair down! I think it looks more natural than it would have looked up. And I wouldn't have been able to pull off those fab earrings with my hair up, I don't think. They are actually a find from JCPenney a few years ago! They are nice and heavy and really well-made. Charlotte looks SO cute here. Pretty blue-eyed girl. Next up, a new mascara. I recently purchased a Cover Girl two-step mascara, but it was waterproof and a royal pain to try to remove each night. I dreaded washing my face for that reason. Plus, after applying it, it always ended up on my eyelids and was a BEAST to try to get off. 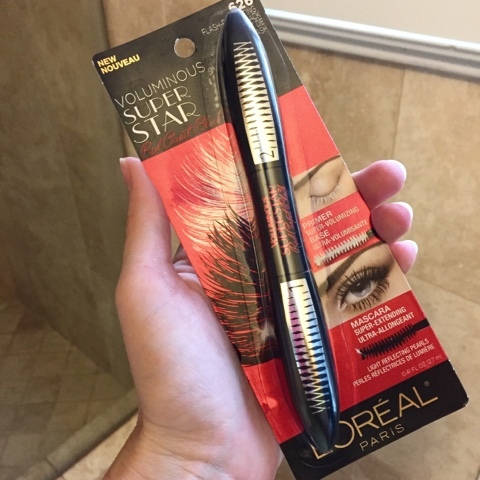 So I exchanged it the other day for L'Oreal Voluminous Super Star mascara. I'm going to link it to Target HERE because it's $9.99 there and I actually paid $11.99 for it at the drugstore, so there's a little cost savings. :) I'm liking it a lot so far and I believe that these two-step mascaras are the best way to achieve long lashes. Lastly, I was invited yesterday to a media preview (gah, I am embarrassed at how cool I feel saying that) of the new GW store. GW is a specialty shop associated with Goodwill. Goodwill Industries here in Charlotte is doing a fantastic job to attract shoppers and support local job-seekers! So, what's cool about GW? 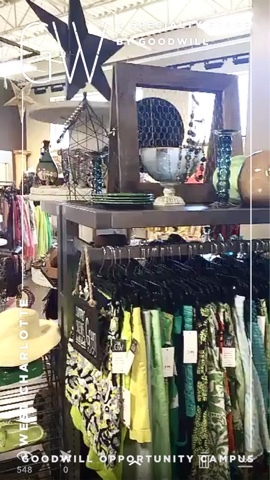 Well, they funnel out all of the higher-end, name brand items that have been donated to Goodwill and they pull them all under one roof. AND - the items keep their low Goodwill pricing. Yesterday at GW I scored this Tracy Negoshian dress for $8.99. I also bought a gorgeous geometric print J. McLaughlin wrap shirt for $12.99. 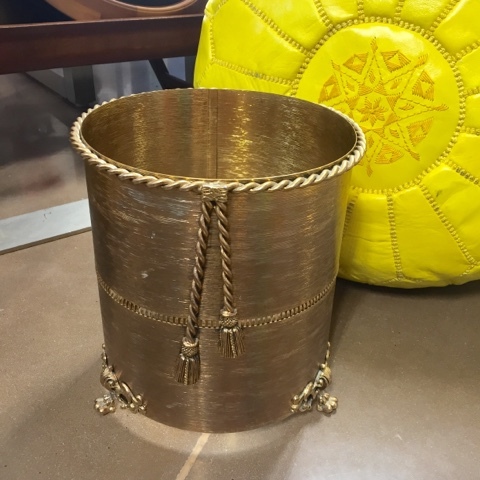 Having major regret over not scooping up this tassel wastebasket cover for $4.99. The sunshiney yellow pouf was $49.99. GW is a permanent store (not a pop-up like their installment last fall) and it is officially open TODAY! It's located at 5301 Wilkinson Boulevard. Definitely worth checking out if you love a deal like I do. Here's a recent article with more details. See you all tomorrow ... I have a great and easy recipe to share! I was just talking to my co-worker yesterday about the GW store! I need to check it out. That's SO awesome! I hope they open up a GW near me! I love Tracy Negoshian (she designs right here in FL down the street from me) and $8.99 is an AMAZING deal! That dress looks so cute on you! 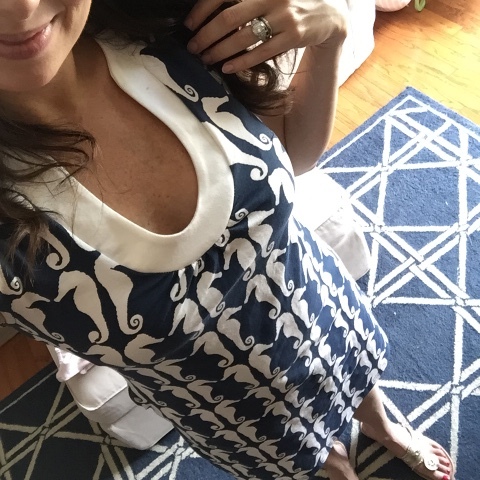 The peek at your photos is just gorgeous of both of you and I love your dress steal from yesterday! April, it is a little on the pricey side but the Lancôme Cils Booster XL Primer is a life changer!! I put it on under my drug store mascara and I get the most compliments. One tube usually lasts me 3 months. Look into it- you won't be disappointed I promise! That GW store sounds so cool! We have several Goodwills around town, but one is named Second Debut Goodwill and now I'm wondering if it's a similar model! I will have to check it out! After seeing your snaps of GW I decided I have to visit it when I come up there next month for a business trip!! I'm excited to see the rest of the family photos. Love the way Charlotte is looking right up into the camera. Those sweet little blue eyes. Oh man, love that GW idea. The pictures look gorge! oooh the GW store sounds amazing! i hope we get one in nashville! SO, SO, SO jealous that y'all have a GW store! Maybe we'll get one in Columbia. Fingers crossed! Also - LOVELY picture of y'all! Catching up on your posts - you look stunning! I actually bought those earrings when you posted about them the first time but I haven't worn them yet so you are giving me ideas. I use a mascara primer from Dior then apply my mascara. The primer definitely plumps up your lashes and I haven't had any problems removing it.